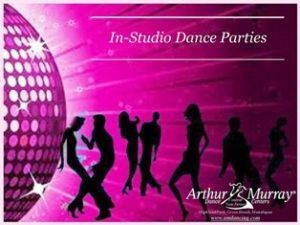 If you are looking for a fun way to share your love of dance with your social circle, try one of our Arthur Murray VIP parties! In addition to our regular weekly practice parties open to our students, as well as our special Open House guest parties, VIP parties offer the opportunity to participate in a personalized group class for you and your social circle! Our students typically take advantage of the VIP parties for birthdays, anniversaries, holiday parties, and more. The 40 minute group class allows the VIP and Co. the chance to try out one or two dances and have a ton of fun! After the class, each guest is given a gift certificate to try out private lessons at the studio. Having the chance to invite your closest friends to join in your favorite hobby makes it fun and stress-free for you and your guests. Many people who would otherwise be intimidated by the idea of taking dance lessons can enjoy the experience with friends, and who knows, you may have opened up a whole new world of fun and social opportunities to them! If you are interested in scheduling your VIP party at the Bellevue Arthur Murray School of dance, give Kelly Peters a call and she will get you started!